The Woolworths dairy claims investigation was a joint effort by Grass Consumer founders. Please see our closing statement here. 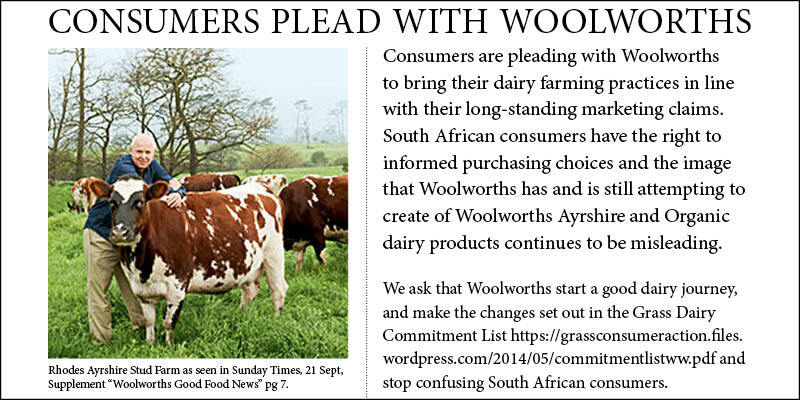 Grass is receiving a number of queries about the Woolworths Dairy Issue, so we have created this temporary page to direct you to various links…if you still have queries, then please contact us at sonia@grass.org.za. We welcome and encourage participation and interaction with South African consumers to form a united and vocal consumer voice. See Our Vision here. The Grass Team discovered that consumers were being led to believe, through misleading labels and marketing, that they were purchasing higher ethically produced Woolworths Ayrshire and Organic dairy products than was the reality. 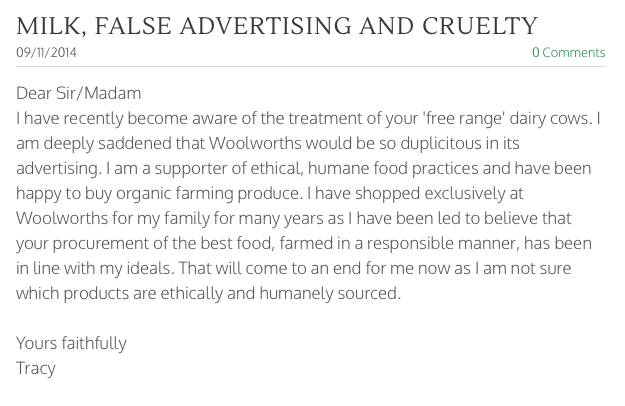 We therefore sent a letter in April this year to Woolworths, along with a Dairy Commitment List asking them to change the farming practices to match the years of misleading marketing messages and labeling of these products. Since this story broke, Grass has received other information from farmers highlighting other dairy farming concerns that we should raise. Such as “continuous use of low-dose antibiotics in the feed, which is standard (stops mastitis, and increases the size of the animal so they mature quicker and don’t get sick)” and what is “the average lactation age of cows when they are removed from milk-producing duties and are slaughtered”. Travelwrite broke the story here. This is disturbing and nauseating! It’s easy to turn a blind eye, and not think twice to hold producers and retailers accountable because you’re worried about what your contribution is to this mess when you have your bowl of cereal or yoghurt. This is about consuming the products, with clarity to you as to how it got to your table. It is not ethical to label in a way that misinforms the consumer. Thabo, it’s also not legal to label a product that misinforms a consumer.